The inaugural lecture by Manuel Steinbauer, professor for Systems Palaeobiology, GeoZentrum Nordbayern, will take place on Monday 5th November 17:15 in the geology lecture hall, Schloßgarten 5, Erlangen. Abstract: Fascinating evolutionary and ecological processes generate and maintain the unique diversity of life on Earth. Using oceanic islands as model systems, the talk will explore how biodiversity dynamics are influenced by geological processes and linked with climate fluctuations. Following their volcanic emergence, oceanic islands are among the highest and steepest mountains globally, which erode during the millions of years of their existence before submerging beneath sea surface. These islands provide repeated natural experiments where independent evolutionary dynamics can be used to disentangle general evolutionary patterns and processes from unique outcomes. The large potential of research on islands for addressing fundamental ecological and evolutionary processes thus originates from the possibility to analyse the same fundamental processes in different systems. A similar setting is provided by palaeontology, where the deep-time fossil record allows the analysis of fundamental processes in variable environmental and biotic setting. 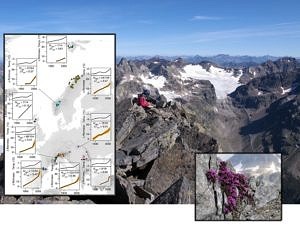 Both, in island biogeography as well as in deep-time palaeontology, increasing data availability and novel analytical methods enhance the potential for addressing fundamental questions on the processes shaping the development of life on earth. Short CV: Manuel Steinbauer studied Geoecology (B.Sc.) and Global Change Ecology (M.Sc.) at the University of Bayreuth where he defended his PhD on biodiversity dynamics in 2013. Before joining the FAU Erlangen in 2018, he was part of the research team on Ecoinformatics and Biodiversity at Aarhus University, Denmark. The new professor for Systems Palaeobiology integrates Geosciences with Ecology and Geography combining informatics and novel quantitative approaches. His research focusses on the interaction between geodynamics and biodiversity including ice-age related sea level fluctuations but also the effect of current climate change on biodiversity. 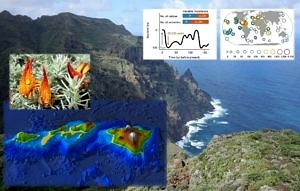 Geological processes and sea level fluctuations influence biodiversity dynamics on oceanic islands. Figure by M. Steinbauer with elements from P. Weigelt. Manuscript in Nature doi: 10.1038/nature17443.